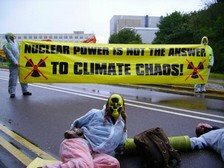 I recently wrote about the BBC not reporting the 24hr blockade of Aldermaston Atomic Weapons Research Establishment and today they are not reporting on a blockade of Sizewell nuclear power station in protest at the government’s flawed report approving more nuclear power stations. This is very disturbing indeed as the BBC is (was?) one of the very few sources of infomation that could be trusted. I and I suspect others, will be demanding an explanation from the BBC and I’ll post any response when received. If you have any doubts about nuclear power then I urge you to watch this documentary The Battle for Chenobyl. If you think it couldn’t happen here then just remember the radiation leak from Windscale, now called Sellafield, that wafted over Liverpool and Manchester without a warning to the population, or Three Mile Island in the USA. Update: I made an official complaint to the BBC and below is their bland response, make of it what you will. I understand that you were disappointed that we did not cover the anti-nuclear protests at Sizewell and Aldermaston on our news. The choice and placement of news items is always a very tricky decision for news editors as with such a wide and varied audience it is difficult to select items that will be of interest to all listeners. We appreciate that viewers want as many items as possible, but there are occasions where a particular story may require a greater share of the running time. I do appreciate your feelings and I can assure you that your comments have been fully registered on our audience log. As you are aware, this is the internal report of audience feedback which we compile daily for all programme executives within the BBC. It’s very helpful to us to hear the opinions of our audience, whether positive or negative and I’m glad you’ve been in touch with your opinion. It seems that it doesn’t matter in which part of the country you live, as soon as a proposal is put in for planning consent to build wind turbines there is immediately a local campaign set up to oppose them. In some cases of course there are indeed good reasons for opposition and a perfect example would be the plan (now scrapped thankfully) to build a 420ft turbine at the Eden Project in Cornwall. This turbine at twice the height of Nelson’s Column would be seen for miles in one of the most beautiful parts of Britain. By the way, the Eden Project is a registered charity and has gobbled up huge grants from the Lottery and other sources but is in fact a massive tourist attraction which is probably why they wanted to erect a record breaking turbine. As a nation we need energy and we need to reduce our carbon emissions and wind generated energy does both. Yes, the wind does not always blow but it usually blows somewhere in the UK so electricity production can be almost continuous. Wave and tidal movement is continuous although conditions obviously pose problems to be solved and ‘clean’ coal fired power stations may also contribute to our needs. One thing is certain though, if wind powered generation is opposed and rejected at the rate that it is then the Government will have a perfect excuse to say that nuclear power is essential. Now what would you rather have near you, a windmill or a nuclear power station? These in fact create carbon emissions in the mining and extraction of uranium along with huge health problems for those involved who are mostly in the developing world. The risks of a nuclear accident are real, remember Three Mile Island, Windscale, Chernobyl. The radioactive waste must be managed for upwards of 5,000 years and so committing hundreds of generations to vast cost and risk. When a wind farm proposal comes up near us let’s stop and think for a moment before jumping on the anti campaign. After all, they are really quite beautiful in a modern sculpture sort of way. At a public meeting called by the Parish Council in Davidstow, Cornwall, recently, there was overwhelming opposition to a proposal to erect 20 wind turbines on a brown field site on Bodmin Moor. In fact only one person out of the 150 people present spoke in favour of the project. These turbines would produce enough electricity for 9,000 homes and reduce carbon emissions by about 30,000 tonnes. Apparently the main cause for concern expressed at the meeting was the possible effect on wildlife. How short sighted can people get? Reducing carbon emissions and thus slowing and hopefully, eventually reducing global warming must surely be of greater benefit to wildlife. Animals and birds quickly learn to adapt to changes in their landscape. For example we’re all used to seeing birds sitting on overhead power lines, they do not sit astride or alongside the insulators and risk electrocuting themselves, do they? There was a time when Britain, indeed, Europe, was practically wall to wall windmills and water wheels for grinding corn and other industrial uses. The wildlife simply adapted so why should albeit modern designed turbines be any more of a threat. They may be bigger but they don’t turn appreciably faster than the old windmills. What these NIMBYS and Luddites fail to appreciate is that if we fail in our attempts to supply electricity through renewable means then the Government will be only too happy to provide nuclear power stations instead. How about one of those on Bodmin Moor. At a public meeting called by the Parish Council in Davidstow, Cornwall, yesterday there was overwhelming opposition to a proposal to erect 20 wind turbines on a brown field site on Bodmin Moor. In fact only one person spoke in favour out of 150 people present. These turbines would generate enough electricity for 9,000 homes and stop the emission of about 30,000 tonnes of carbon dioxide a year. Apparently the main cause for concern was the possible effect on wildlife. How short sighted can people get? Reducing carbon emissions thus helping to slow and hopefully eventually turning back global warming must surely be beneficial to wildlife. Animals and birds quickly learn to adapt to changes in their landscape. For example we’re all used to seeing birds sitting on power lines, they do not sit astride or alongside the insulators and electrocute themselves do they? There was a time when Britain was practically wall to wall windmills for corn grinding and industrial use and the wildlife simply adapted so why should modern designed wind turbines be any more of a threat. They may be bigger but they don’t turn appreciably faster. What these nimbys and Luddites fail to grasp is, that if we fail in our efforts to supply electricity through renewable means then the Government will be most happy to provide nuclear power stations instead. How about one of those on Bodmin Moor?